If you’re LOSING SLEEP, we’ll trap & relocate the critter! Possums are commonly found in suburban areas, where they are often considered pests owing to their habit of eating fruit, vegetables, flowers and tender young shoots from gardens, and nesting in roofs. The loud hissing, crackling territorial call of the male Common Brushtail may also be a problem for suburban residents. Natural deterrents which play upon the possum’s acute sense of smell are often employed to discourage them. These include cloves of garlic, camphor or naphthalene. As a native species possums are protected by regulations, even when they reside in urban neighbourhoods, and cannot be baited. They cannot be killed as pests, and if captured the regulations stipulate that they must be released within a small radius of that locality, since they are territorial creatures. Preventative measures such as blocking off their access to the roof spaces or building a possum nesting box for an alternative home are instead recommended. The Possum’s rank odour is due to it’s over-sized musk glands located behind each ear. Noises in the roof cavity. The Common Brushtail Possum frequently spends the day in the roof cavity of houses, where its urine may damage plaster and it may chew wiring or cause anxiety because of the loud vocalisations and thumping in the ceiling when two possums are squabbling. These noises may continue at night, as possums may not emerge from the roof until well after dark. Possums frequently cross house roofs on their way to feeding areas. A Common Brushtail Possum that is running makes heavy thumping noises that may waken some people. If two possums are fighting on the roof, the heavy thumping noises are accompanied by loud squealing calls that can be alarming. A large part of the diet of both the Common Brushtail Possum and the Common Ringtail Possum comprises the leaves, buds, flowers and fruits of many garden plants. Certain plants may be the focus of repeated feeding by possums for many days or even weeks. Such concentrated feeding may cause severe defoliation or even death of plants, or may result in most or all the flower buds being eaten. 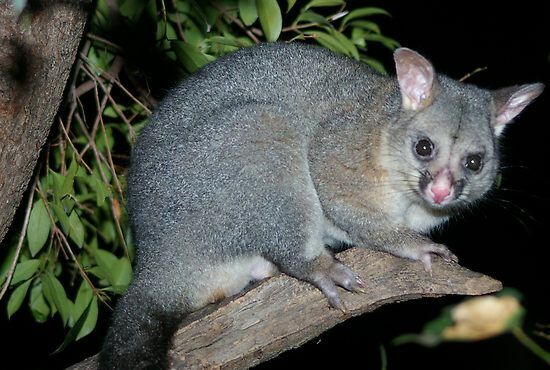 In some areas, certain plants cannot be grown unless they can be protected from possums. Where possums spend time in trees or other plants overhanging paved areas such as driveways, paths and patios, their droppings accumulate on those areas or on parked cars and may be seen as offensive by some people. Possums causing dogs to bark. Some dogs bark persistently at possums, causing annoyance to their owners and to neighbours.